One can only hope that your child will eat whatever you make for them but the truth is our kids come out with their own ideas about how to approach the world. We all try to be consistent with healthy and desirable options but sometimes we’re forced to grab what’s quick, or what we know our kid will eat when all else fails. On a good day, we seek to model behaviors we want to encourage. We want our kids to be adventurous and try different flavors. We want our kids to be polite and know how to sit down with others for a meal. And we want them to enjoy the adventure of making food and see meal times as a happy, healthy part of our daily ritual. Food offers a wonderful opportunity to connect with our kids by sitting down face to face and talking about their experience, or hoisting them up onto our hip to show them what we’re stirring and giving them spoons of their own to play with. When cooking for our kids, we seek balance not only in the meals we make and the ingredients we chose but also in our approach. We must balance their needs with ours. We strive to prepare dishes that we’d like to eat ourselves but recognize that some days do not go according to plan and require a different type of cooking all together. With time and practice, we found that we can create smaller meals with fast preparation times and healthy ingredients that provide our kids the energy they need to get through the day. To help you get started, we’ve come up with a short checklist to run through in your head to help you devise balanced meals for your children. There’s no reason to go overboard with this, but by focusing on a few themes you might be surprised by how much easier it is to prepare dishes that you feel confident about, while expanding your child’s taste buds and making great use of what’s fresh and available. Whole – Does this dish include whole or minimally processed ingredients? Sure it says organic, non-GMO and whole grain on the box but what other ingredients are in there (stabilizers, oils, SUGAR!) that are unnecessary to your child’s diet. As a rule of thumb, if a box of food has any ingredient we can’t pronounce or that doesn’t seem to belong (e.g. not flour, milk, honey, salt, etc. ), then we put it aside no matter what claims it makes. Making your own version of macaroni and cheese, or spooning in a drop of honey or jam into plain yogurt takes only a few minutes more than using store bought options but guarantees that your kid’s food is whole and filled with less additives. Not to mention significantly cheaper! Fresh – Does this dish include one or more fresh ingredients? While you may not always have access to an abundance of fresh ingredients, particularly in the dead of winter, there are certain veggies that are available year round which are incredibly versatile, such as carrots, broccoli, yams, and grape tomatoes. For a quick and easy option, we love frozen peas. With loads of vitamin C, plus vitamin A and iron, they’re perfect when fresh veggies aren’t readily available. Slip some veggies in with their favorite dishes and rest assured your child will be getting the important vitamins they need as they grow. Protein – Does this dish include enough protein to ensure my child won’t burn calories too quickly and be left hungry within the hour? Pasta with tomato sauce is a nutritious meal, but adding cheese or cooked ground beef to the pasta (and maybe some peas) will help curb their hunger for longer and minimize the risk of a sugar crash. If your family doesn’t eat meat, then try finely chopped nuts, cheese, high-protein grains like quinoa, or legumes. If your child is able to digest dairy, then make their oatmeal with milk, mix yogurt in with their applesauce, or add a spoonful of almond butter to their smoothie. 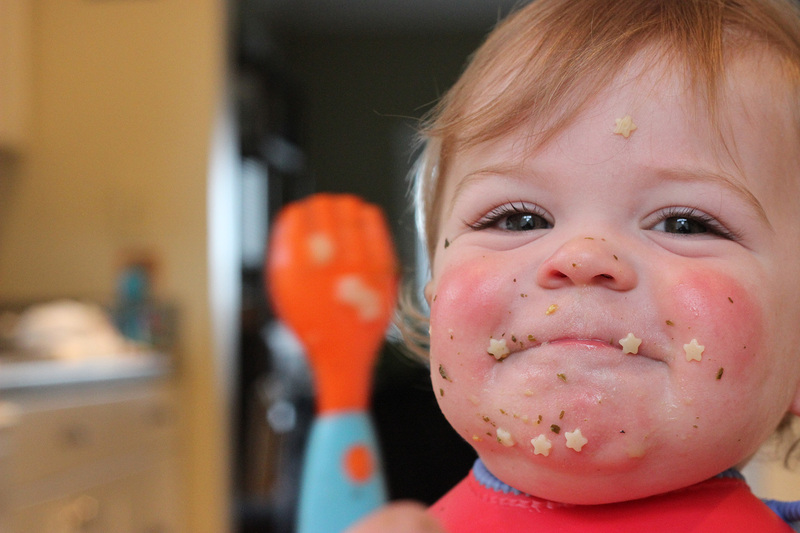 Colorful – Are there at least 2-3 different colors in my child’s meal? Colors signify the presence of certain vitamins and minerals. One way to ensure balanced nutrition is by incorporating as many colors into a dish as possible. By throwing in some grated carrot or raw beet or finely chopped spinach or cauliflower (just because it’s white doesn’t mean it’s not as healthy), you’ll maximize your child’s nutrition while exposing their taste buds to a diversity of flavors and textures. Don’t forget fresh herbs. Basil, parsley, thyme and other herbs pack a concentrated vitamin punch and can usually be found year round in the grocery store. Portions – Can this dish be made in small portions, or if it’s reheatable, a larger portion that can be eaten again during the week? Often we accomplish this by cooking a larger portion of grains that can be used for our dinner later in the evening. If you have access to a bulk section of your grocery store, we find it useful to buy smaller quantities of ingredients. We also love whole wheat pasta as it’s easy to throw a handful of noodles in boiling water to create child-sized meals. Waste – Does this dish minimize food waste by incorporating small portions of leftover veggies and fruits? Half a carrot, a small handful of snap peas, leftover cooked beets, that might otherwise get lost in the fridge only to be thrown out at the end of the week can easily be incorporated into a child-size meal. Sharing – Is this dish something I want to eat as well; does it encourage communal eating and create an opportunity to model good table manners? While it’s important to create balanced meals for our kids, it’s also critical that we as parents continue to eat the way we want to. If you’re making something you want to sit down and share with your children, you’re more likely to also eat a balanced diet while being afforded the chance to share some quality time together. Throughout our Kid’s Meals posts you’ll find recipes that adhere to these principles of balance. We’re not claiming to be supermoms by any stretch, but have found a way to incorporate this set of criteria into our cooking in a way that doesn’t feel stressful. We hope that by following these recipes and using these techniques, you’ll be able to do the same.